At 16 years old, Super Smash Bros. Melee has no shortage of unique glitches and mechanics hidden in its GameCube-era code. At this past weekend’s Runback 2017, Justin “Plup” McGrath went hurtling into one of those glitches during a doubles match: an invisible ceiling that spiked him back down to the ground. The invisible ceiling glitch, or “ICG” in Smash shorthand, is a confusing glitch. It’s shown up at the strangest times on stages including Battlefield, Dreamland and Final Destination. What ICG does, in effect, is reset the player’s vertical velocity to zero. It most often occurs when a character hits another’s shield, which creates recoil for the attacker. If the attacker leaves the ground in some way, or is damaged, the game might not register the end of that force, and the physics will react in strange, somewhat random ways until they make contact with the ground again. Most famously, it occurred in the deciding game of a best-of-five at 2015's The Big House 5 tournament, where Abate seemed to miraculously recover mid-air to knock out his opponent. Though the consequences weren’t as dire at Runback this weekend, it’s still pretty entertaining to see the ghost of ICG reappear at random to spike a few players around. 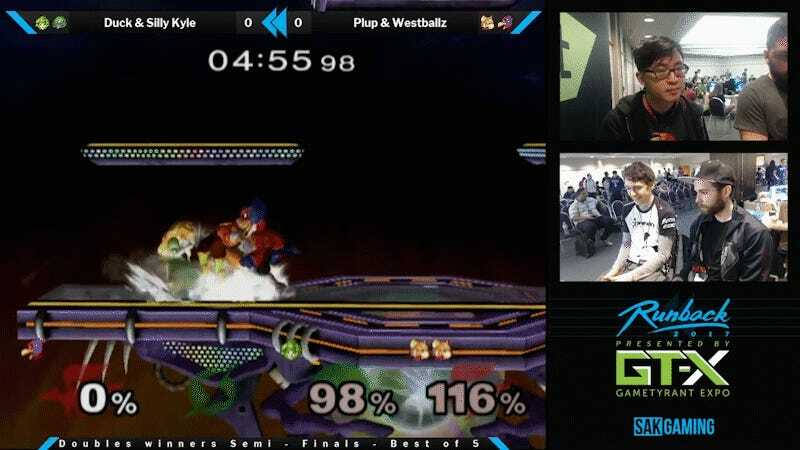 The exact method to replicate it is still a bit inconsistent, but Smash pro Adam “Armada” Lindgren recorded a video last year that visually breaks it down.